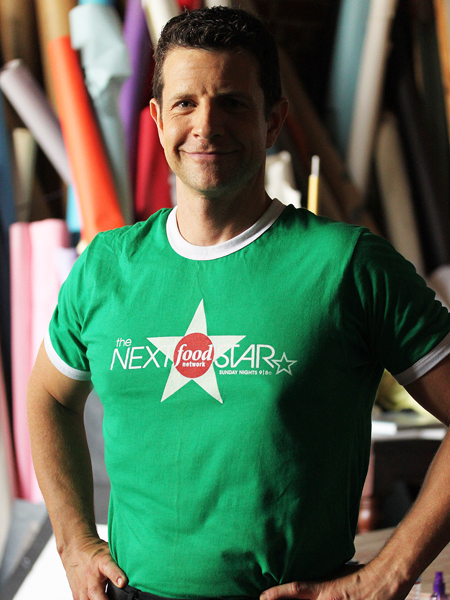 Remember back in 2007 on The Next Food Network Star, there was that cute young Hollywood Celebrity Chef and Caterer Paul McCullough, that everyone was sure was going to be the winner? Even Anthony Bourdain. And then it got to the Iron Chef Challenge with only four contestants left and he was eliminated that night! 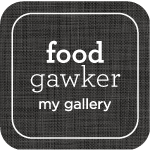 Well, that was the experience, the seed, of an idea for his cookbook that will be coming out in November. You see, Paul is convinced that the decision to eliminate him from the NFNS show was because he couldn’t give the correct answer to a question asked by a judge regarding a Roma Tomato. Possibly because he didn’t like tomatoes in the first place. So after leaving the show he went to Australia and ended up eating quite a few tomatoes, which he ultimately decided he loved. Over the next couple of years, after returning to Los Angeles, he made tomato dishes of every size and style, and when he decided to write his first cookbook, it was, of course, all about tomatoes. It’s title: Roma-Therapy. 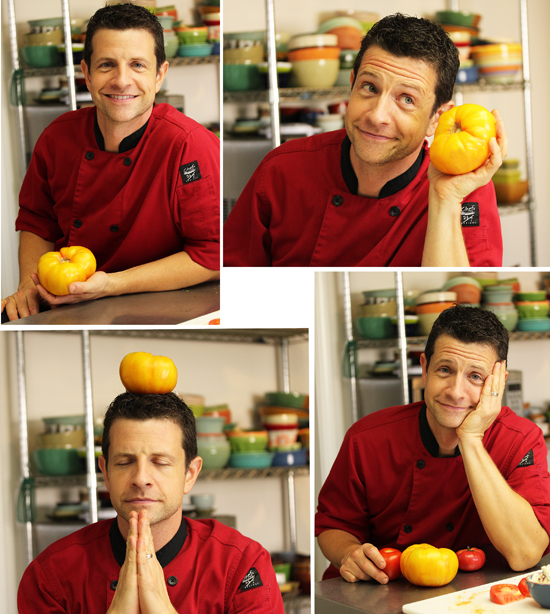 Paul McCullough is the Owner and Executive Chef of Paul’s Kitchen, a boutique catering and events company in Hollywood. 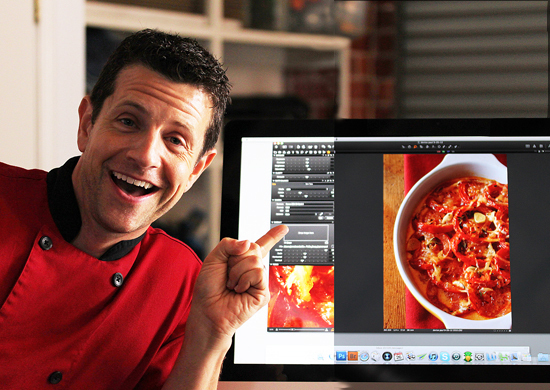 He has appeared regularly as a celebrity food stylist and guest chef on Extra, KTLA Morning News, The Fine Living Network, USA Network and LATalkRadio.com. He has catered for celebrities such as Kelly Clarkson, Lance Armstrong, Tom Hanks and Beyoncé. He also caters VIP events for City of Hope National Medical Center. You can read two articles about him here and here. So, recently I received an email from premier food stylists Denise Vivaldo and Cindie Flannigan of the Denise Vivaldo Group asking if I would be interested in covering a food photo shoot at Jon Edwards Photography studio for a cookbook by Chef Paul McCullough. Chef Paul had been researching Jon Edwards on-line and came across my post about another photo shoot I had written about Jon. 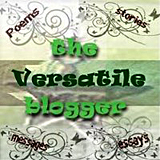 He liked it very much and wondered if I would be interested in chronicling his book shoot. Emails flew back and forth and, of course, I said Yes! 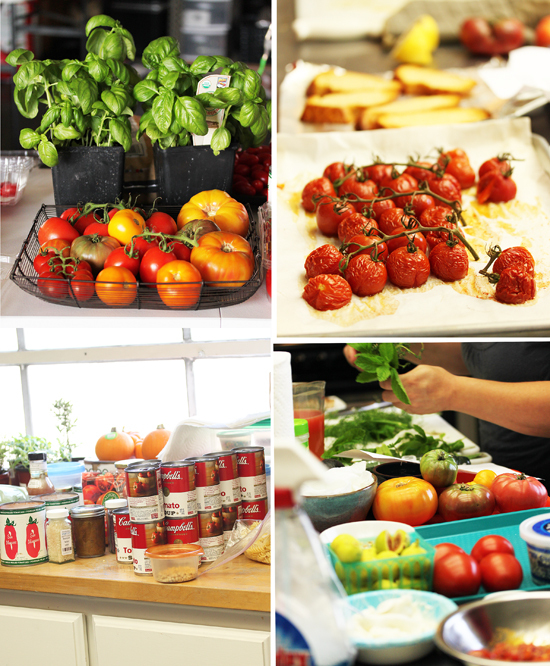 When I arrived at Jon Edwards Studio, I discovered that there were tomatoes covering every surface, not only in the kitchen, but in the studio as well. 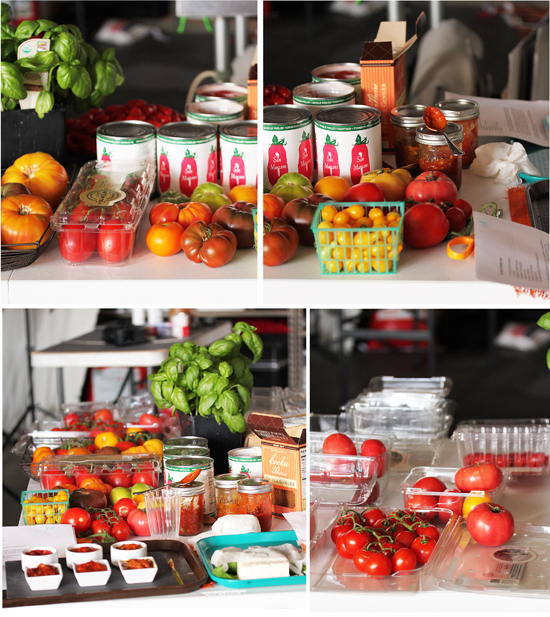 After meeting Chef Paul and having it explained that they were going to shoot 25 tomato dishes that day, the vast array of tomatoes made perfect sense. When I asked Chef Paul to tell me about his book, Roma-Therapy, he explained that it is going to be a gift-type book, not just a cookbook, although it will have 25 fabulous tomato recipes with beautiful photographs. It is going to be about his life in tomatoes and what he has learned about them, tomato lore and legend, facts and figures. It will be a small-ish book, maybe 7×7-inches, a fun, whimsical take on tomatoes that can be given as a hostess gift, stocking stuffer, or a birthday gift for someone who has everything. 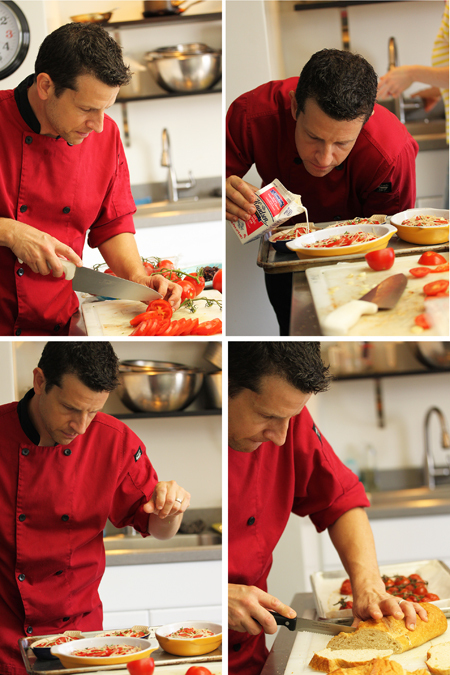 Here you can see Chef Paul in the kitchen prepping for each dish. He and his assistant did all the prep work, and prepared the dishes that were baked in the oven or on the stovetop. Chef Paul was cheerful, energetic and focused all day as he kept track of the ingredients for each recipe and made sure that the dishes were flowing from the kitchen to the studio at a good pace. 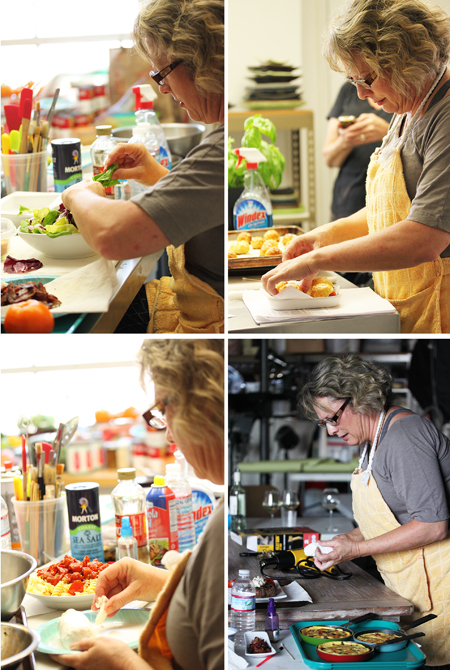 Food stylist Cindie Flannigan was working in the kitchen at the other end of the table from Chef Paul. Her job was to choose the plate or bowl from the prop stores for each recipe, then build the components of the dish in an artistic way for the camera. After collecting everything that may be needed for that dish, the hero was placed on a plastic tray and carried by Cindie to the holding table in the studio to await its turn. 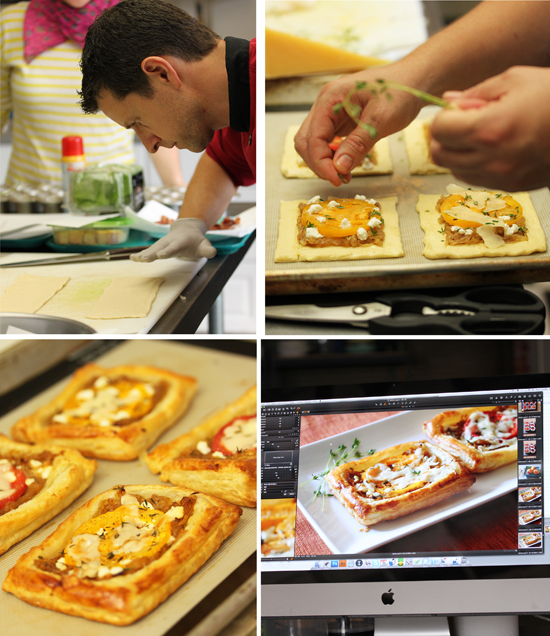 Here you can see the journey of a puff pastry tomato tart starting in the kitchen as Chef Paul makes sure the pastry is the right size and thickness. It is topped with caramelized onions, a tomato slice and two cheeses and baked to perfection. And finally its beauty shot in all its golden glory. 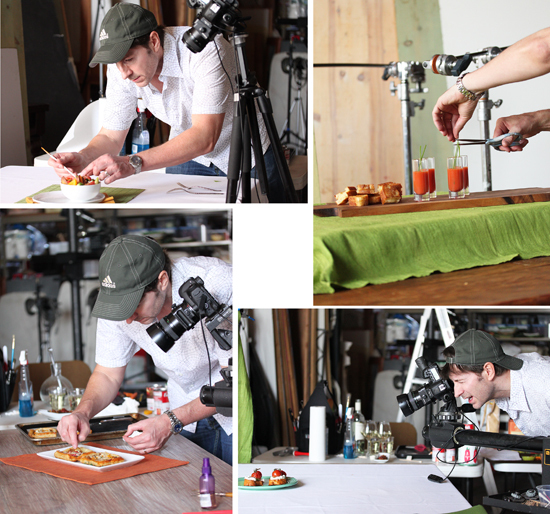 While Chef Paul and Cindie were working away in the kitchen, there was a different kind of action in the studio where the photos were being taken. Here you can see Artistic Director Jeremy Stanford making sure the heros are perfect, the shot is lined up the way he likes it and that all of the chives are the same height. The AD’s job was to make sure the shots were set up with all of the components in place, which kept him hopping, because there were two tables and two cameras working at all times. These are three trays, fresh from the kitchen, sitting on the holding table waiting to be set up in front of the camera. One came with extra soup in a measuring cup in case the AD or food stylist wants to change the level in the glasses. Sometimes the heros come from the kitchen covered with damp paper towels so they don’t dry out. Or they come fully plated, but with a little plate of extra components in case the stylist doesn’t like the ones on the plate. This one also came with a torch, possibly to make the edges of the steak more charred or to melt some of the tomato herb butter on top just before the shot. 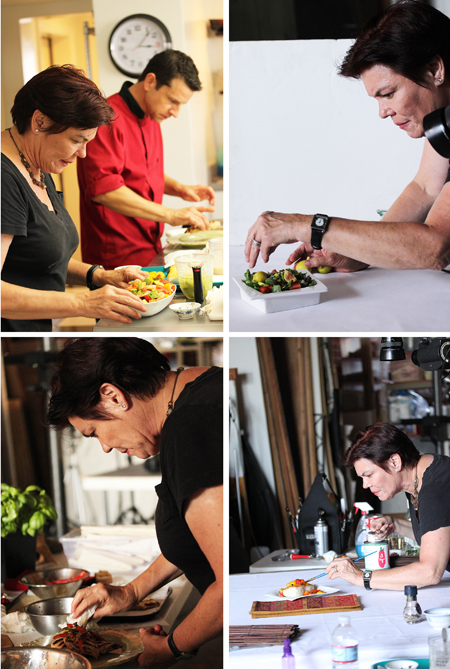 Here is our famous food stylist, Denise Vivaldo, in the studio making sure each little component of the hero is artistically placed. She is the one who chooses the surfaces on which to shoot, picks several possible props to go in the photo, such as napkins, wine glasses, forks, placemats and makes sure each plate is free of smears or crumbs. Once the hero is in front of the camera, she may paint a little oil on a component if it looks dry or, after looking at the shot on the computer monitor, move components or props around. Aren’t these the most beautiful popovers you have ever seen. Chef Paul made them for one of the recipes, but then the food stylist decided they were awkward on the plate once out of the pan, so they were not used. They were, however, delicious, and the recipe is at the end of this post. Probably the most important person at a photo shoot is the photographer, in this case world famous Jon Edwards. He is the one who takes a dish, and with his artistic eye and years of experience, makes it look beautiful beyond compare. He is the one who chooses what angle to shoot from and how to frame the food in the photograph to best advantage. Jon Edwards goes about his work quietly and with a sure hand, and each photo is absolutely stunning. The last time I was in this studio, Jon was shooting with a Hasselblad camera, but he is now using a Canon 5D Mark II with a 90mm shift lens. And sometimes he has to climb way up on a ladder to get that perfect overhead shot! Towards the end of the shoot, I realized that I had been taking photos of serious people doing serious work all day, but I had none of anyone looking happy and smiling. So I asked Chef Paul if he would mind smiling and to my delight he had no problem mugging for the camera. Him and his yellow tomato. This guy is just the greatest. Wow, what a day! Thank you Chef Paul for inviting me to record your cookbook photo shoot. It was amazing! Also a big thanks to Jon Edwards, Denise Vivaldo, Cindy Flannigan and Jeremy Stanford, for letting me get in the way and photograph your every move. You are all so inspiring with your perfect work and attention to details. Thank you again! 1. Preheat oven to 425 degrees F. Place one oven rack in bottom third of oven. Place 2nd rack in upper third of oven and place a cookie sheet on it to shield popovers from direct heat. 2. 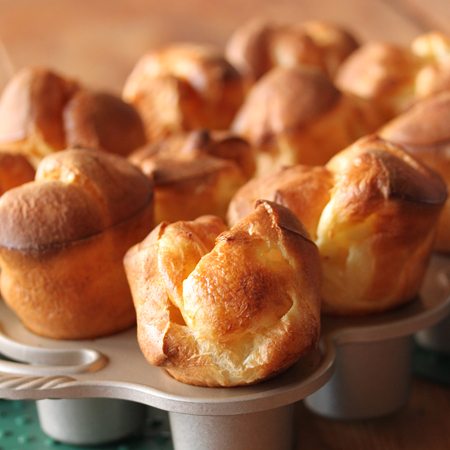 Spray a popover pan, muffin tin or 12 Pyrex custard cups on sheet pan, with cooking spray. 3. In a large bowl, whisk together all ingredients until smooth. A few little lumps are ok. Pour batter into a 4-cup measuring cup with a pouring spout. Let batter sit at room temperature for 30 minutes. 4. Stir batter a few times before pouring. Fill each well 2/3 full and bake on lower rack of the oven for 20 minutes. 5. Do not open the oven door. Reduce oven temperature to 350 degrees and bake for 15 minutes more. 5. Pierce side of popover with knife as soon as you take out of oven, so steam can escape. Serve immediately. 6. Bake remaining batter as above. Note: To keep warm, after piercing, return to turned-off oven in pan for up to 30 minutes. What fun was that! Thanks for taking us all along on the journey. I couldn’t think of anyone better than you to cover this photo shoot. Job well done. How cool is that?! I am going to keep an eye out for the book….perfect Christmas gifts! Wow, what an amazing experience, and you captured it all so beautifully! Bravo! What a great experience. Please let us know when the book is out, or its ISBN, sounds like a great gift and even better with this story. Thanks Lynne for all your love and care with this piece! More good things to come for sure! 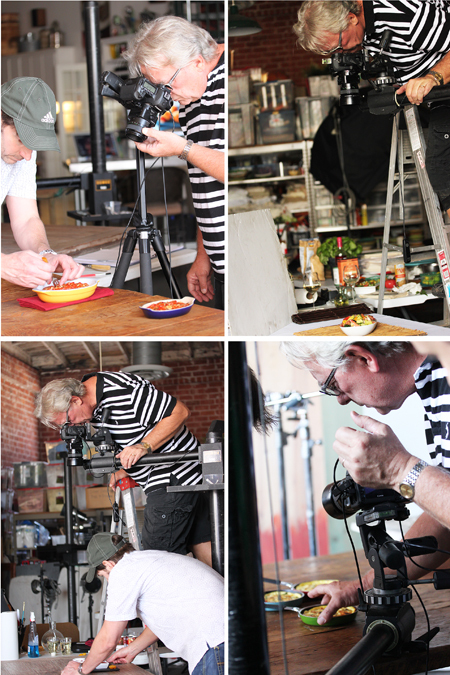 What a great post – it’s wonderful to get a real tour of what goes on behind the scenes in a professional food photo shoot. Thanks so much for writing this. You must have had a lovely time!